Subaru is developing its first hybrid model and the new hybrid powertrian will be ready to make its global debut this year at the 2013 New York Auto Show. The Detroit Bureau is reporting that Subaru official Kenichi Yamamoto, director of product management and coordination at Subaru of America, confirmed parent Fuji Heavy Industries is working on a hybrid. While we already knew Subaru is planning on bringing out a hybrid, the publication says the new Subaru hybrid will make its world debut at the 2013 New York Auto Show at the end of March. And the new hybrid model is expected to make its launch sometime later this year. In the Detroit Bureau article, Yamamoto explained that “Subaru’s interest in hybrid vehicles follows the steady expansion of hybrid sales in Japan. Hybrids now account for a large and growing share of the new vehicles sold in Japan particularly those from Toyota, Honda and Nissan, Japan’s three largest automakers.” Even though Subaru has seen record sales in the U.S., Australia and Japan, sales are lagging in Europe for the Japanese automaker. Subaru needs to compete around the globe and will feature a new gas-electric hybrid vehicle to keep the sales momentum going. Subaru has been tight-lipped about the new hybrid, but we can get an idea of what might power the hybrid with a powertrain similar to the Advanced Tourer Concept that made its debut at the 2011 Tokyo Motor Salon. The hybrid show-car was powered by a 2.0-liter turbocharged inline-four engine paired with an electric motor producing just 13 horsepower of assist. Energy was stored in a small lithium-ion battery pack recharged by regeneration during braking and coasting. We reported here earlier this month that Subaru could be offering the new Subaru hybrid powertrain in the all-new Forester. There has been speculation that it could also be the Legacy mid-size sedan or possible the newly designed Impreza that is already the most fuel-efficient all-wheel-drive in their lineup at 36 mpg. The new Impreza has been wildly popular here in the U.S. and has led the charge for Subaru’s record sales in 2012. It very possible that Subaru could offer the hybrid model in the new Forester, and then eventually offer it in several different models in their lineup. The popular new 2014 Forester could be the perfect model for Subaru to launch the new hybrid. The Forester has been completely redone both inside and out and is built on the Impreza platform. We do know that Subaru is designing the new hybrid technology in-house and will not be getting the system from another company like Toyota. Subaru has been working on developing their own gas-electric system and it shows their plans for the future will include the new technology. Subaru has plans to boost fleet-wide fuel efficiency by 30 percent by 2015 and new hybrid powertrain and fuel-thrifty continuously variable transmissions (CVT) will move them in that direction. Regardless of which model will feature the first Subaru hybrid powertrain, the Japanese automaker is planning to aggressively market their new hybrid vehicle around the world as they advance their global stategy. It will be a major part of their vehicle lineup in the future and it won’t be just a token hybrid in their lineup to help them create a “green” image or meet regulatory requirements. 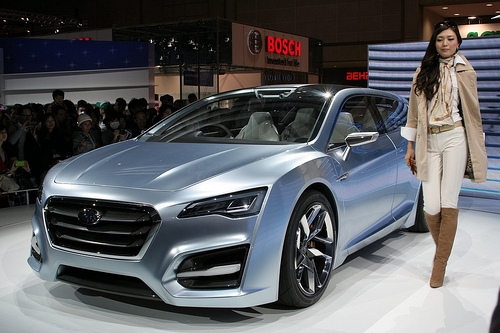 Look for the new Subaru hybrid model to make its global debut in New York at the end of March. If it has a 13HP electric motor, then it's a mild hybrid not a full hybrid. Not advantageous on the highway. It's a start for Subaru who has been slow to react, most likely dues to the financial constraints of designing a car like that. I was wondering if they were going to use the Toyota Synergy Drive system of their own. Most likely, Toyota's. It's normal for them to introduce a mild hybrid. I can't recall a mainstream carmaker introducing a sophisticated hybrid yet. I'm glad they are finally doing it. My wife's 2002 WRX is getting to the point where we are looking at options.